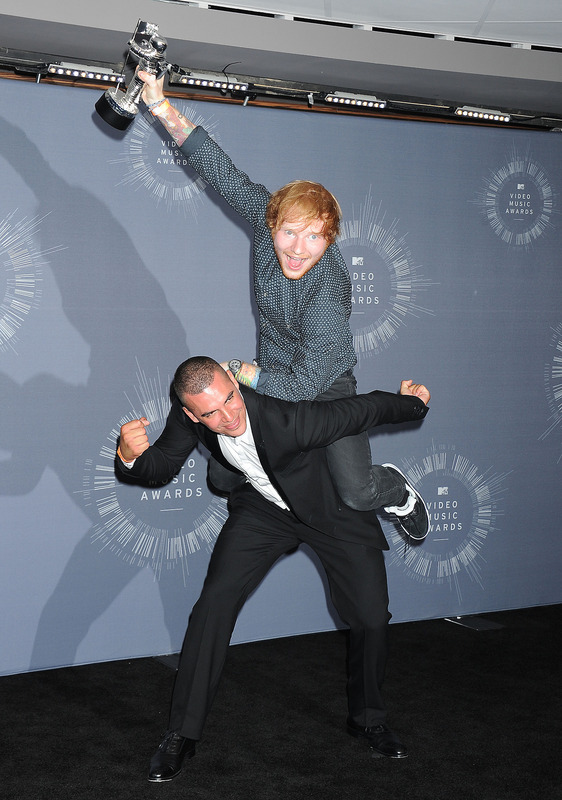 Awards Shows are my favourite ever annual events (after Christmas and my birthday) And as deemed one of the most exciting and outrageous music ceremonies, the MTV Video Music Awards certainly delivered last night. Here are my best dressed and favourite highlights from the show. all hail our 90s queen Gwen Stefani who arrived wearing her own design from Lamb Couture and looked incredible whilst blocking pink and black with her platinum hair. forever babe. Starting with a bang (I refuse to acknowledge the fact that ariana grande opened) Nicki Minaj absolutely DELIVERED with Anaconda. The set, the costume, and the choreography were everything that the VMAs go on for. Nicki was on point vocally and I think her performance as a whole was the exact balance of hoe bag and professional female boss that you wanna be – the blend that Miley Cyrus aimed for and totally lost at last year performing there. Nicki looks so happy and healthy lately and I feel after a few questionable singles she is back better and badder than ever. My favourite Nicki performance to date and despite her later featuring on Bang Bang where she suffered a minor wardrobe malfunction which evidently affected her performance all is forgiven after a 10/10 opening. Everyone loves a throwback especially in the form of Justin Timberlake & Britney a la 2001. Thankyou Katy Perry & Riff Raff for reminding us of this gorge denim Versace number and congratulations on the deserving award! As always the Kardashian Jenner clan were the height of controversy last night however not in a good way. This really pisses me off because they looked so good and instead of this post being centred around Kims shapely Balmain dress, Kendalls Alon Livne pant suit or Kylies luxurious and classic silk black gown by Alexandre Vauthier it now seems to be all about their total ignorance during the minutes silence the common proposed for murdered Ferguson teen Michael Brown. Kim Kendall and Kylie seemed to be unaware of their chances of being filmed during this time and instead used the silent opportunity to get onto there phones. This aired in the USA however on tonights UK showing the clip seems to have been edited out. Well I guess the Kardashians do have more power than we are aware of. Disappointing actions yet delicious outfits. When Miley Cyrus posted a pre red carpet selfie on her instagram page with a guy called Jesse I wondered who he may be but passed it off as one of her ever changing friends. I was as shocked as many when Miley pulled a U-ie and went back to her seat after Jimmy Fallon announced her victory. Instead, Miley had asked her (date?) to accept her award on her behalf and to address the problem of homelessness in America in particular Los Angeles. Whether it was an act of love, a ploy or a genuine plea for change, it was a lot preferable to her shocks and surprises at the 2013 VMA’s. there is an ease that comes with watching Beyonce in that you know that you can without a doubt expect a professional, athletic and entertaining performance which will contain no flaws and be choreographed so perfectly that it makes every other performer look like an amateur which of course is what everyone is in comparison to Queen B. Beyonce covered a 15 minute medley of The Visual Album and in my opinion perfectly selected the best parts of each song to perform which I was thrilled about. 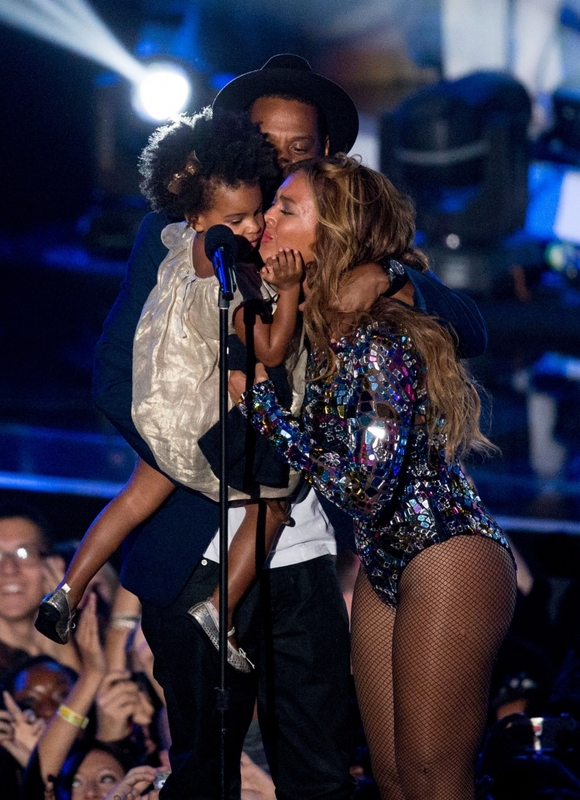 The performance was seemlessly ended with an emotional presentation of the Michael Jackson Video Vanguard Award by no other than Jay – Z and Blue Ivy themselves. Beyonces face broke down at the sight of her husband and daughter on stage and all divorce speculations were as i imagined DEMOLISHED in an instant. It was fulfilling watching her normally composed self take in the crowd and appreciation and her gratitude was genuine and heartfelt. Nothing short of obsessed with the Carters. 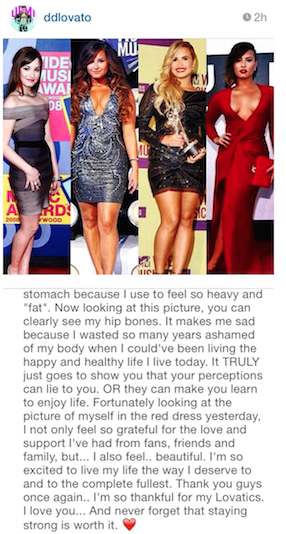 An emotional photo collection and comment from Demi Lovato who reflected on her former self harm, substance abuse and eating disorder which resulted in a three month rehab stint. Demi now sets the best of examples to not just young girls, but anybody who has struggled with these issues and emotional pain all over the world and she does so whilst looking absolutely stunning. 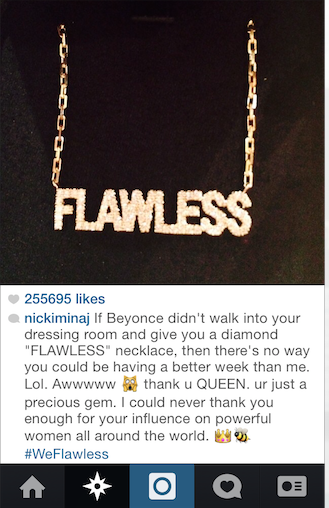 so the clear winner of the entire awards show was Nicki Minaj after she received the most coveted gift of all – a dressing room visit from Queen Bey herself. Goals. To conclude the whole show ran smoothly for the most part and I thought it was vastly improved from last years (car crash) show. All in all though I am left still pondering; whether I want to be a part of a world in which Lourde wins an award of Arctic Monkeys. Ah, America.